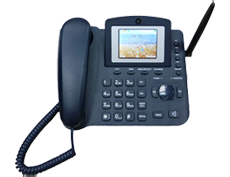 This model is an ideal handsfree GSM desktop phone for business or domestic use, it has a large colour display and keypad, as is of a very robust yet stylish design. The Large Colour Display provides a menu drivin operating system similar to most Mobile Phones. QUAD BAND - HSDPA/WCDMA/GSM/GPRS/EDGE - 3.2 Inch Colour TFT Screen 320 x 240 Pixels - AMR,ACC, MP3 & Wav file formats - Bulit in 0.3MP CMOS Camera - Integral Battery Backup. - Supports Hand free, Caller ID, Radial and Second-Dial function. - Load your own ring tones and background images.